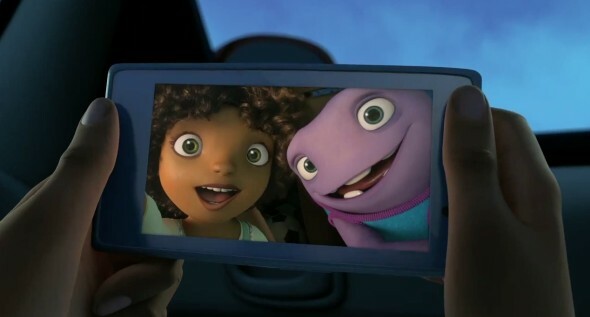 Home – DreamWorks’ latest animated adventure – is the genuinely sweet tale of an alien invasion of earth. Little bubble-driving cowards called Boovs, fleeing their arch enemies the Gorgs, take over Earth, moving the entire human population to Australia. Boovs are a proud collection of conformists, which is why lonesome and blunder-prone Oh (Jim Parsons) is an outcast and, eventually, a fugitive. It’s a fish out of water buddy comedy brimming with lessons on bravery and letting your freak flag fly (or not being afraid to be you), which means it resembles about 45% of our current animated output. Still, director Tim Johnson’s the animator behind the nonconformity classic Antz as well as the genius Simpsons Treehouse of Horror episode Homer Cubed. Does that mean we can at least hope for some inspired comedy? Inspired is a strong word. Like his inescapable TV persona, Parsons is adorably geeky, and Rhianna delivers the required goods as the spunky tween protagonist. Steve Martin also hams it up enjoyably as the Boov’s inept leader Captain Smek. There are more than a few laughs, and though most of the sight gags are aimed at parents, the entire film is tender and wholesome enough for the very young. And though the 3D is often superfluous, the animation is really gorgeous. Still, there’s nothing new to see here. If you’re in the market for a film that offers your wee ones positive examples aplenty – girl power, anti-colonialism, nonconformist messages among many, many others – this movie hits every mark, although it does so in a way that won’t leave a big impression. Even if you’re looking for an inoffensive time waster, Home fits that bill. Think of it as a colorful, sweet, blandly likeable 94 minutes worth of teachable moments.